Check out our current incentives, and stop in for a test drive at our dealership in Greeley! Boasts 49 Highway MPG and 55 City MPG! This Honda Insight delivers a Gas/Electric I-4 1.5 L/91 engine powering this Variable transmission. BLACK, FABRIC SEAT TRIM, AEGEAN BLUE METALLIC, Wheels: 16 Aluminum Alloy. *This Honda Insight Comes Equipped with These Options *Wheels w/Machined w/Painted Accents Accents, VSA Electronic Stability Control (ESC), Variable Intermittent Wipers, Trunk Rear Cargo Access, Trip Computer, Transmission: Electric Continuously Variable -inc: ECON, Sport and EV drive modes, Shift-By-Wire (SBW) and deceleration selectors, Tires: 215/55R16 93V AS, Tailgate/Rear Door Lock Included w/Power Door Locks, Systems Monitor, Strut Front Suspension w/Coil Springs. Delivers 40 Highway MPG and 31 City MPG! This Honda Civic Hatchback delivers a Intercooled Turbo Regular Unleaded I-4 1.5 L/91 engine powering this Variable transmission. CRYSTAL BLACK PEARL, BLACK, FABRIC SEATING SURFACES, Wheels: 17 Alloy. *This Honda Civic Hatchback Comes Equipped with These Options *VSA Electronic Stability Control (ESC), Variable Intermittent Wipers, Valet Function, Trip Computer, Transmission: Continuously Variable, Transmission w/Driver Selectable Mode, Tires: P215/50R17 91H AS, Systems Monitor, Strut Front Suspension w/Coil Springs, Steel Spare Wheel. Boasts 25 Highway MPG and 18 City MPG! This Honda Ridgeline boasts a Regular Unleaded V-6 3.5 L/212 engine powering this Automatic transmission. CRYSTAL BLACK PEARL, BLACK, CLOTH SEAT TRIM, Wheels: 18 Gray-Painted Alloy. *This Honda Ridgeline Comes Equipped with These Options *VSA Electronic Stability Control (ESC), Variable Intermittent Wipers, Valet Function, Urethane Gear Shift Knob, Trip Computer, Transmission: 6-Speed Automatic, Transmission w/Driver Selectable Mode and HD Oil Cooler, Tires: 245/60R18 105H AS, Tire Specific Low Tire Pressure Warning, Tailgate/Rear Door Lock Included w/Power Door Locks. Scores 25 Highway MPG and 18 City MPG! This Honda Ridgeline boasts a Regular Unleaded V-6 3.5 L/212 engine powering this Automatic transmission. DEEP SCARLET PEARL, BEIGE, LEATHER SEAT TRIM, Wheels: 18 Exclusive Machine-Finished Alloy. *This Honda Ridgeline Comes Equipped with These Options *VSA Electronic Stability Control (ESC), Variable Intermittent Wipers, Valet Function, Urethane Gear Shift Knob, Trip Computer, Transmission: 6-Speed Automatic, Transmission w/Driver Selectable Mode and HD Oil Cooler, Tires: 245/60R18 105H AS, Tire Specific Low Tire Pressure Warning, Tailgate/Rear Door Lock Included w/Power Door Locks. Scores 28 Highway MPG and 19 City MPG! This Honda Odyssey delivers a Regular Unleaded V-6 3.5 L/212 engine powering this Automatic transmission. WHITE DIAMOND PEARL, BEIGE, LEATHER SEAT TRIM -inc: front and outboard 2nd-row, Wheels: 18 Dark Silver-Painted Alloy. * This Honda Odyssey Features the Following Options *VSA Electronic Stability Control (ESC), Vinyl Door Trim Insert, Trunk/Hatch Auto-Latch, Trip Computer, Transmission: 9-Speed Automatic -inc: Shift-By-Wire (SBW) and paddle shifters, Transmission w/Driver Selectable Mode, Trailing Arm Rear Suspension w/Coil Springs, Tires: P235/60R18 103H AS, Tire Specific Low Tire Pressure Warning, Tailgate/Rear Door Lock Included w/Power Door Locks. 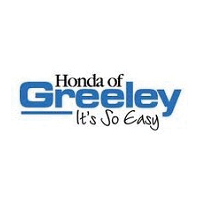 And when you apply to finance a new Honda at Honda of Greeley, you’ll also enjoy special advantages like certified Honda technicians and a dedicated service team. Our dealership opens Monday through Saturday at 8:30 a.m., and you can reach our staff with questions about our current new Honda specials at (970) 363-8044.